Inspired by the opulent splendor of the jewels of the Royal Crown, master-jeweler Thomas Sota, has meticulously created this Engagement Ring truly fit for a Queen. 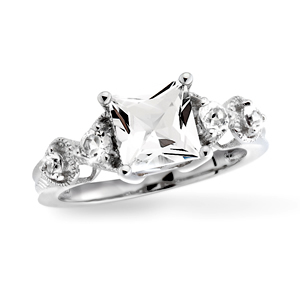 The dazzling 1¾ carat Princess-Cut White Topaz is set in Sterling Silver lavishly plated in Platinum. The exquisite center stone is adorned by delicate hearts with White Topaz along the shoulder.